Megafaun’s breadth of style has been a hallmark of all its releases thus far, but the Heretofore EP is possibly the best example yet of the rambling, shifting and well-sequenced tendencies of the band. But it’s a touch ironic to say that considering that this record is, in many ways, also their most accessible and pop-leavened. The EP is bookended by two of the loveliest songs in their catalogue to date: the anthemic and surging title track and the loping, sweet and sighing “Bonnie’s Song.” Megafaun have long been experts at crafting some of the most maudlin moments from their harmonies alone and these two songs are perfect examples of this. The latter especially, a song written about a family friend of the Cook brothers who gave Brad his first guitar, is as perfect an ending to the record as one could ask for. 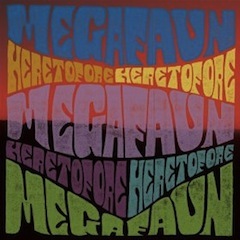 Never heard of Megafaun before, but I love this track! One of my favorite releases of the year. Great review. Could not agree more. Have been listening to this album for about a month now, and was wondering when/if the drunkard was going to do a write up on it or not. I have seen this band a few times live and enjoy their first couple LP’s but I think they have really hit their stride with this one.